Let your friends and family relax in comfort while enjoying cocktail and snacks on this Renaissance Outdoor Patio 5-foot Hand-scraped Wood Garden Bench, sounds perfect! Made from 100% Acacia Hardwood that is native to Australia and Asia, and used in the construction to make excellent and high quality furniture that resists mold, mildew, fungi, termites, rot, and decay. Every edge of of this bench is hand scraped that looks like a distressed heirloom piece that will bring your outdoor patio an amazing look. This metal garden butterfly chair will be a beautiful addition to your balcony, patio, front porch or garden area. Butterfly chair will add a functional, elegant, focal point in your home or outdoor living space. Renaissance Outdoor Patio 5-ft Hand-scraped Wood Garden Bench Let your friends and family relax in comfort while enjoying cocktail and snacks on this Renaissance Outdoor Patio 5-foot Hand-scraped Wood Garden Bench, sounds perfect! Made from 100% Acacia Hardwood that is native to Australia and Asia, and used in the construction to make excellent and high quality furniture that resists mold, mildew, fungi, termites, rot, and decay. Every edge of of this bench is hand scraped that looks like a distressed heirloom piece that will bring your outdoor patio an amazing look. 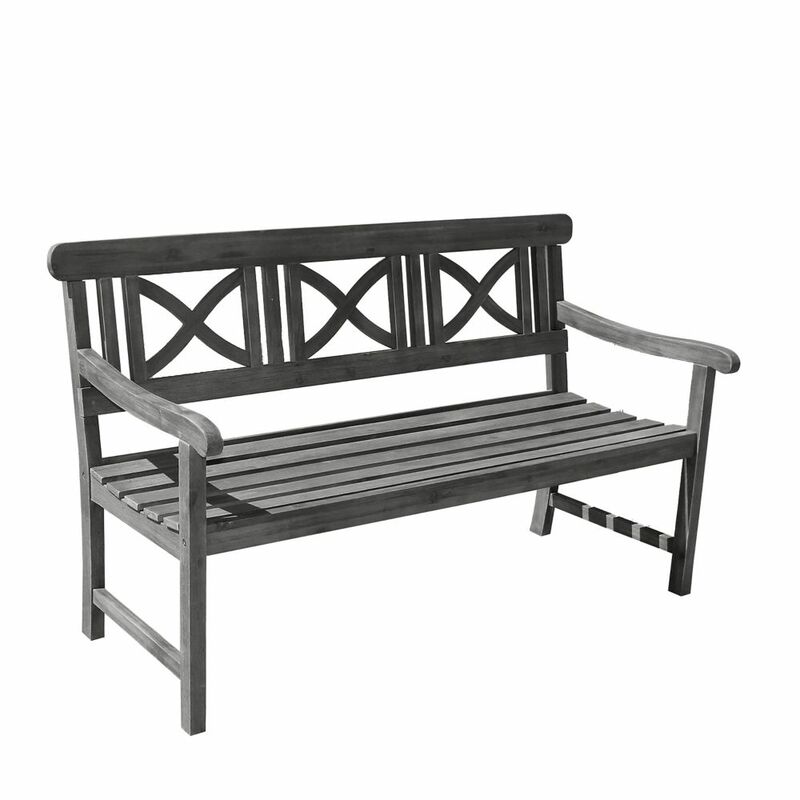 Renaissance Outdoor Patio 5-ft Hand-scraped Wood Garden Bench is rated 4.0 out of 5 by 14. Rated 2 out of 5 by Katrina from The bench arrived with several nicks and scrapes in the... The bench arrived with several nicks and scrapes in the wood. Rated 4 out of 5 by Dianne from The bench is attractive. It is lightweight and easy... The bench is attractive. It is lightweight and easy to put together. Rated 4 out of 5 by Anthony from The bench itself is excellent. It came with the right... The bench itself is excellent. It came with the right model number on the box, but was four(4) inches shorter than the one I ordered. I paid extra for the different size for a measured spot. It was a gift for someone or I would return it for the right one. Rated 5 out of 5 by Girlygirl from Easy to assemble. Very attractive!! Would definitely recommend; however, more of a brownish grey. Easy to assemble. Very attractive!! Would definitely recommend; however, more of a brownish grey. Rated 4 out of 5 by LoveChristmas from Loved the bench, but...the screws are junk! The assembly instructions... Loved the bench, but...the screws are junk! The assembly instructions were very vague, Didnt show correct placement of cross pieces so the seat sits on the supports. I put one upside down and when I realized I needed to change it, I was unable to remove screw as it was stripped. Be careful! Rated 5 out of 5 by Bonnie from Easy to assemble and feels very sturdy. ... Easy to assemble and feels very sturdy. Rated 4 out of 5 by HomeDepotCustomer from Easy assembly and beautiful coloring. Has greenish hue perfect for outdoor setting. Easily hold... Easy assembly and beautiful coloring. Has greenish hue perfect for outdoor setting. Easily hold two adults. Love it.